Car Shopping? Check out this 2012 Mitsubishi Eclipse for sale Greater Kansas City area! 2012 Mitsubishi Eclipse FWD 2.4L I4 CD Stereo w/Aux, Alloy Wheels, Rear Spoiler, Power Windows & Locks, Certified Warranty. HARD to find, EASY to drive! Have a great time in than this beautiful creampuff. Life is full of disappointments, but at least this outstanding Mitsubishi Eclipse will always be there for you and never let you down. We will pick you up at the airport or ship your vehicle to you! 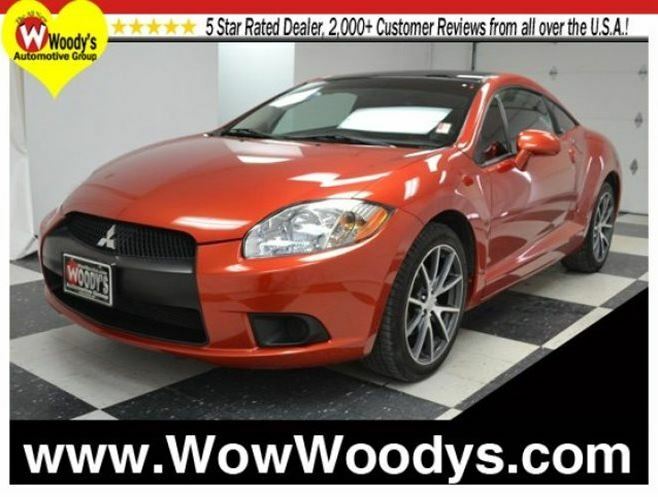 If you’d like more information about this luxurious used Mitsubishi Eclipse our huge selection of other used Mitsubishi or 700+ vehicles located near Kansas City please visit our website and provide us with your contact information. One of our empowered Woody’s Automotive Group Sales Advisors will contact you promptly.